Canada's Brooke Henderson has moved into sole possession of first place at the halfway mark of the LPGA Tour's season opener. The 21-year-old native of Smiths Falls, Ont., carded a four-under 67 in the second round on Friday to move to 10 under at the Diamond Resort Tournament of Champions. 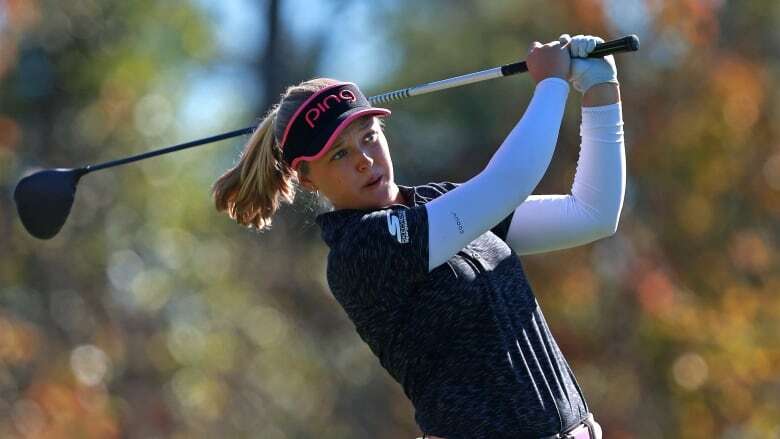 Canada's Brooke Henderson kept out of trouble and kept bogeys off her card Friday on her way to a four-under 67 and a two-shot lead in the Diamond Resorts Tournament of Champions, the winners-only start to the LPGA Tour season. "It's always fun to be in the final group and be in contention," Henderson said. "It's what we play for pretty much every single week. It's nice to be here. It's only the halfway point, but I still need to make a lot of birdies and keep hitting it to win." She didn't make as many birdies as she wanted in the second round, but it was enough. Henderson began the back nine with two straight birdies, and closed with seven straight pars to stay in the lead. Ariya Jutanugarn, the No. 1 player in women's golf who captured every major award last season, made two bogeys, including the par-3 closing hole. The Thai is not sure how she didn't make more, considering how she hit the ball. "I didn't expect to finish 4 under today at all because I hit everywhere. I keep missing fairways and greens, and I'm at 4 under," Jutanugarn said. "I'm going to say my short game helped me a lot today because I keep missing the green — and I'm not missing by two yards, I'm missing by like 10, 15 yards." "I asked him how to manage when you're like the best player, like how to manage everything," Jutanugarn said. "We talked all 18 holes, and he helped me a lot with like how to manage, be like a top player. ... It means so much to me. Ray is so nice to me. I kept asking him questions." Henderson won two times last year, including the CP Women's Open in Regina. She won the KPMG Women's PGA for her first major in 2016. Despite shutting it down for two weeks over the break while in Canada, she likes the mix she had of rest and practice when she got back to the work. "Overall, I'm really happy to be in double digits after two rounds. That's pretty cool, minus 10," she said. "So I feel like there's not too much wrong, but just maybe a little bit of inconsistency. Some putts, I wasn't hitting them quite as well as I would have liked."